Some SOB didn't make sure of the legality of this animal before pulling the trigger and left it lay when he/she found that it was illegal. It obviously isn't over 50" and the two brow tines on each side are symmetrical and clearly visible with no questionable points that may have confused the shooter. On a side note, there is a LOT of bear activity around here and may be worthwhile pursuing them. Very disgusting indeed. A sad sight, to say the least. I hope you called the authorities. I'm not sure what they could do about it now. The animal has been there for several days from the amount of decay so far. I'll call it in just to be sure tho. Looks like it's been there for a while. I hope you did give fish and game a call. Nothing worse the pochers. Very curious as to how you know how it was killed? I have personally watched bears take down a healthy cow and a healthy 40+ inch bull, both during moose season. Looks like bears have been on the carcass to me. But there was no evidence of a fight. The grass that was trampled was in a tight circle around the animal. There was no hoof scrapes, gouges in the dirt, etc. to lead us to believe that this moose had fought (and lost) a bear. I think the bears got to it after it was already down. was there a road nearby? Say within a mile or a bit more? Moose, deer and elk have been known to travel quite a distance from a vehicle collision...Often they look unscathed on the outside. You can definitly tell when a moose was killed while fighting with a bear. I watched a cow get brought down by a brownie years ago and it was a sight. The blood and the how torn up the ground was was unmistakable. Plus this particular brownie started burying it right away. I wish I still had the pics. I wish they would catch who ever did this. Although still a possibility of natural death, doubt it but still there. No roads for several miles. This area is heavily hunted, especially the bow season and opening week for rifles. Given the easy access and heavy competition, I am guessing the animal fell victim to an inexperienced hunter or trigger happy drunk. If you dont KNOW it was poached - for Krikeys sake - dont ASSUME it was poached. This Moose could have died from a number of different issues. They are susceptible to Disease, injury, etc - and when you post something like this - the only things that can come from it as bad. Yes we need to be our brothers keeper, but for once it would be nice to see people error on the side of innocence before running this up the "fry the *******s" flagpole. If it WAS poached - then report accordingly, but so far - i dont see anything other hearsay. But just last evening in unit 14 a large black bear charged an almost legal bull moose. They did not make contact but it is kind of surprising. So I guess it is possible the moose is a bear kill...but unlikely. Not saying where because the bull might be legal...needs a closer look. judging from the position of the head, & body, the back looks like it was skinned from the neck to rump & then not even finished, not much like an animal kill, where if it were, the gut's would have been eaten first. AKMud, what other evidence did you find to lead you to believe this was a poached animal? Well.....I didn't dig through all the maggots trying to find an entrance/exit wound or a spent bullet. The hide looked like it was untouched, I would assume (there's that word) that a fight with a bear would produce some lacerations and some large hair clumps found around the area. I would also think that there would be a large area of matted down grass and fireweed and some ground disturbance if a fight with a bear was what caused this moose to die. I saw none of this. It appeared to me that the hide had not been opened at all until the bear pulled the section off of its hind quarter. The meat from this quarter was still pink even though the chest cavity was completely engulfed in maggots. They had obviously been working on the carcass for several days. The tips of several antler points had been knawed on as well as the jaw/nose. There was no velvet left on the antlers. 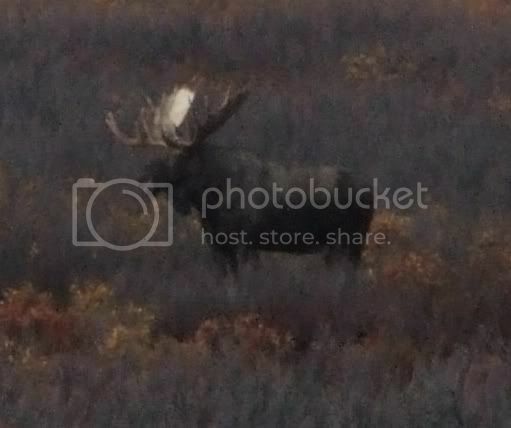 I have seen three different bulls near this area so far this year and all of them were still in full velvet with no rubs. I don't know what this proves/disproves, but I thought it was interesting. Maybe that was what the maggots ate first. Unless this bull died of SARS or the bird flu..... I didn't find enough damage to say it was from a bear. This area is heavily hunted and I would bet my next paycheck that it was a mistake made by a hunter. I didn't say it was an intentional poaching. I think after the trigger was pulled and the hunter saw that it wasn't legal, he/she walked away from it. This scenario happens A LOT! Yes we need to be our brothers keeper, but for once it would be nice to see people error on the side of innocence before running this up the "fry the *******s" flagpole. I'm a staunch believer in "innocent until proven guilty" and since I am not pointing the finger at one person, I don't believe I am out of line here. You are are playing the poaching card with a picture of a dead moose and assuming it died at the hands of a "not so perfect" hunter ( I dont deny they are out there!) when you have ZERO proof that it died at the hands of such. Why even go there? If you want to make a point about people shooting illegal bulls thats fine, but don't try to use a picture of a decompsoing moose to drive the point home. Thats a trick those those Animal Activists use all the time, and I ASSUME (hah!) that infurates you as much as it does me. For we know this moose could have died from a wound that occurred a mile before it laid down, it could been caught in a flood ,exhausted and too tired to eat and died. It could have been a hundred different things and you know it. Thats all I'm sayin here and since your going to play one side - I'll go ahead and play the other. Anything could have happened to that animal. In Mud's defense however, its not often you come across a 1 1/2-2 1/2 yo moose dead and for the most part untouched by bears. (I know there was apparently some superficial scavaging). Gogoalie +1, the guts would've been devoured soon after a kill, one would suspect. The fact the animal is skinned back seems fishy, too. I read in todays paper a "hunter" was caught poaching a sublegal moose, during closed season, with an atv in a controlled use area. Enough alledged lawbreaking there for several poachers. The troopers saw him from the air and coordinated to ground troopers to get the guy. Without the airplane presence, this guy woulda probably walked, er, road, with meat in tow. Poachers are all around us. The cop in me says to approach it as an illegal kill. No signs of a fight. Carcass not buried indicative of a bear kill. Wolves possibly, but I would imagine that a lot more of the meat would be scavenged if it were wolves. The only way to be certain would be to run a metal detector over the carcass to see if it picked up any hits from bullet fragments. What??? Now even the troopers are poaching hunters by spotting them from the air and using radios to make contact with and guide other troopers on the ground to a bust? What an unfair advantage. I say troopers should have to wait til the next day after flying to make a bust, and using radios for relentlessly chasing poachers? They need to go to ethics school obviously. I heard Mike Strahan is conducting a seminar on ethics when chasing poachers, for the troopers. It will cover some of the same topics twodux mentioned. Good post twodux!!!!!!!!!!!!! Man it takes some doing to get a rec from martintrapper. Even though the post was done tongue in cheek. As you know MT, I myself preach ethics from time to time, but I couldn't resist poking fun at that story and at ourselves. We trust you grew a thick hide this year. lol! All times are GMT -8. The time now is 00:52.